Lady Anne Clifford (1590-1676) was the restorer of both this parish church and the castle at the other end of the town, c. 1655. Her tomb, presumably made of the same Frosterly marble as the font, is in the north side chapel, along with that of her mother. 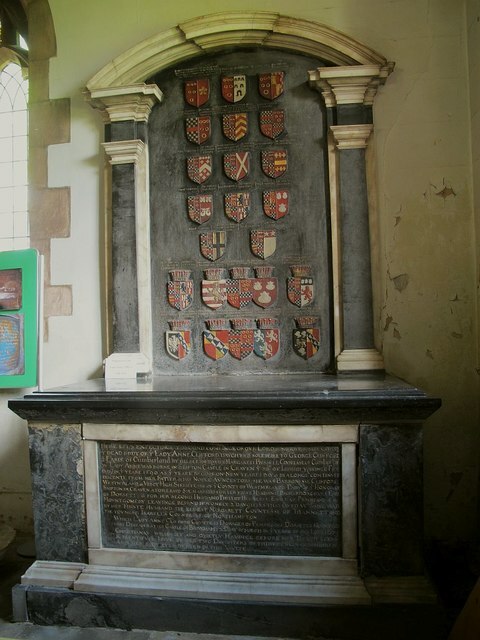 It bears all the arms of Clifford heraldry and alliances, as a visual family tree of the landowning family of which she was the last to bear the Clifford name. The inscription is too long to be translated here in full but can be found online elsewhere. The parish church of Appleby, in the Anglican Diocese of Carlisle, stands at the bottom of Boroughgate (the principal street of the town centre). The lower stage of the tower survives from the Norman period circa 1150, contemporary with the Castle at the top of Boroughgate. The south porch and most of the body of the church is C14/C15, in "decorated" style on the inside and "perpendicular" on the outside. The north chapel and chancel were rebuilt by Lady Anne Clifford in 1655. The building was restored again in 1861-2 and 1960. It is noted for Anne Clifford's tomb in the north side chapel, the organ of 1571 (formerly in Carlisle Cathedral), the C15 rood screen and a font of Frosterley limestone. The building and its curtilage are listed grade 1 (list entry 1312067).